The holiday season is a busy, but fun time of year! From office parties to cookie exchanges and family gatherings, your social calendar is probably packed. And what happens at most of these festivities? That’s right, we eat! Sharing food is part of the holiday season but it is easy to get side-tracked and forget about your weight loss goals. Some studies suggest that the average adult gains one pound during the holiday season. That may not sound like a lot but it adds up over the years and contributes to obesity later in life. Exercise will not only help keep you on track to reach your goals, it will also help keep your stress level in check and strengthen your immune system. Plan to take a walk, jog, ride a bike, or give yourself a gift and try something new! Sleep is an important way to stay healthy and strong, especially during busy times. Try to get 8 hours of sleep each night. Bring a side dish to the party. It may sound easier to swing by the grocery store on your way and pick something up that is ready-made. But, by making your own side dish, you can experiment with new recipes and make some substitutions that will be party-pleasers. Try using applesauce instead of oil to reduce fat and calories. Also, sprinkle herbs like rosemary and thyme instead of salt to decrease the sodium. Eat before you play! 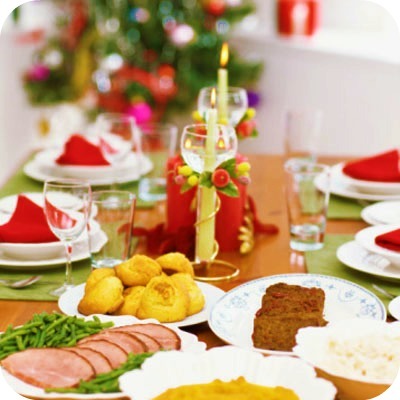 Eating a healthy, high fiber meal before a holiday party will help you avoid over-indulging on the tempting treats! Holiday beverages: Did you know that the average cup of eggnog packs almost 350 calories and 19 grams of fat? Try some sugar-free hot apple cider mix or low-fat hot cocoa to enjoy a festive drink that won’t pack on the pounds! Plan ahead! Take exercise clothes with you when you travel & have workout shoes with you at all times so that you can fit in a walk. Remember that even 10-minute exercise sessions have huge payoffs! Avoid eating out. All-day holiday shopping can leave you hungry and tempted to stop by the food court or drive-thru window. Be sure to have healthy snacks on hand like nuts, bananas, apples, or peanut butter on whole wheat bread. Pencil time for yourself into your calendar. If you don’t schedule time to exercise and prepare healthy meals, it can be easy to push those things aside. Plus, exercising and eating right will help boost your energy so you can do all those things on your list!